After a rough weekend series against the Houston Astros where the New York Yankees saw themselves win only one game, they still managed to stay in first place. The A.L. East will be a tough division all year long, and while the Yankees can ill afford to rely on other teams losing, it greatly benefited the Bombers that the Orioles have lost four in a row, and the Rays took two of three from the Red Sox. Sunday night against the Astros on a night where Derek Jeter had his number retired, the Yankees had a chance to split the series with what looks like the best team in baseball, but failed to do so. However, after going down 8-0 early, the Yankees did what they have done all season, and that is fight. They were able to make the game closer than it should have been, ultimately falling by a final score of 7-10. Tuesday night in Kansas City, the Bombers resumed play for a three-game series with the Royals. The struggling, and very inconsistent C.C Sabathia (2-2, 5.77 ERA) took the hill looking to just keep the runs under control, having given up eleven runs in his last two starts. Was bad luck a factor in some sense? Sure, but the Yankees expect better from the veteran and so does Sabathia. A solid start, with minimal runs would go a long way for the lefty’s confidence. 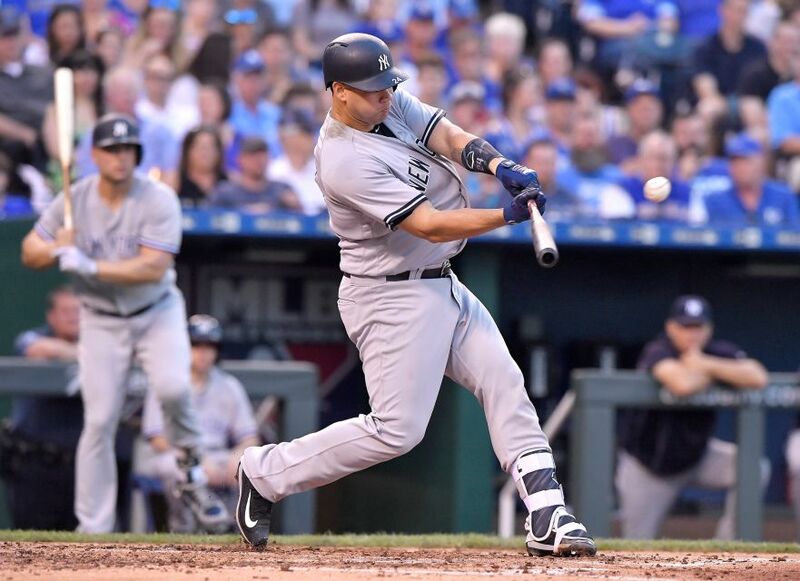 The Bombers were able to get off to a quick start against the 35-year-old Jason Hammel (1-4, 5.97 ERA) with the surging Gary Sanchez hitting a three-run homer to center field. After three innings, the Yankees held a 3-0 lead. 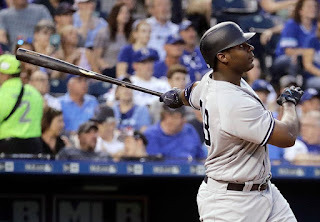 In the top of the fourth inning, the Yankees free agent signing that is known to be hit or miss, Chris Carter, hit his second homerun of the year to center field bringing in Didi Gregorius. Through four the Bombers held a 5-0 lead, and that would be all they needed tonight as Sabathia was in top form. Although Hammel went six innings, he gave up five earned runs and nine hits. The reason many teams stayed away from him in the offseason, is due to his age and regression and that showed tonight as he repeatedly found himself in trouble with two outs. 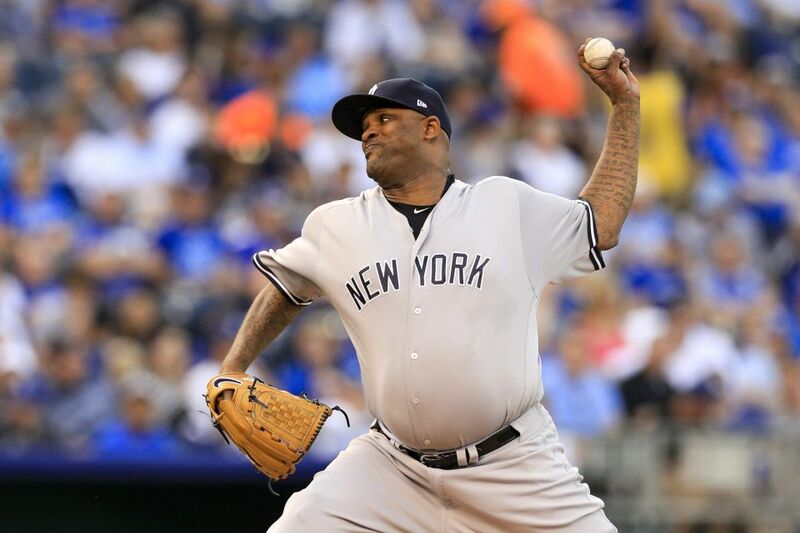 For the Yankees however, Sabathia was solid. He pitched six and two thirds, solid innings allowing five hits and keeping the Royals off balance all night. Credit Chase Headley with some stellar defensive work at third base, but tonight belonged to Sabathia. There is nothing better than hitting the road as a team, and getting a quality start from your pitcher, and conserving your pen for the rest of the trip. During the top of the seventh inning the Yankees were able to add an insurance run against reliever Seth Maness. 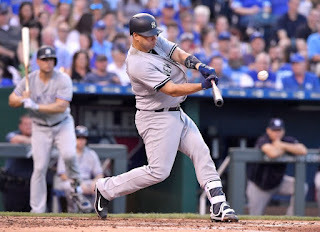 Three straight singles by Starlin Castro, Aaron Judge, and finally Jacoby Ellsbury gave the Yankees additional run support should they have ran into trouble. Trouble came in the seventh inning for Sabathia. Having managed his pitch count all evening, C.C. was in a great spot to give the Yankees seven solid innings. At any rate, Eric Hosmer led off the inning with a double to right field, and after two strikeouts, Jorge Soler walked. 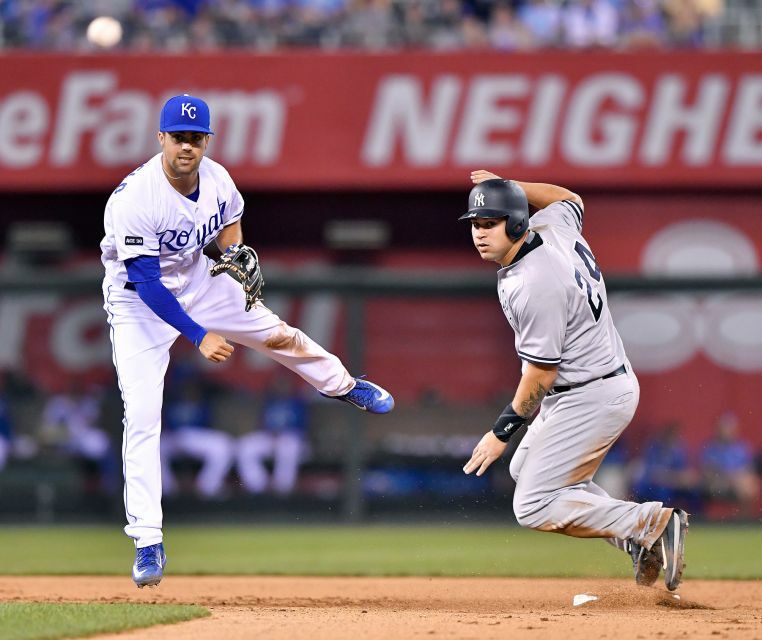 With runners on first and second, two outs, Sabathia allowed an infield single to Alex Gordon. Headley was falling away, and could get much on the throw. With the bases loaded in the bottom of the seventh inning, Sabathia’s night was over. Tyler Clippard would come in to strike out second-baseman Whit Merrifield to put an end to the threat. The Yankees continued to get on base during the top of the eighth inning. Gregorius led off the inning with a walk, and Chris Carter singled on a line drive to right field. On a challenged catch on a lineout by Brett Gardner, the Yankees had two men on Gary Sanchez worked a walk to load the bases. 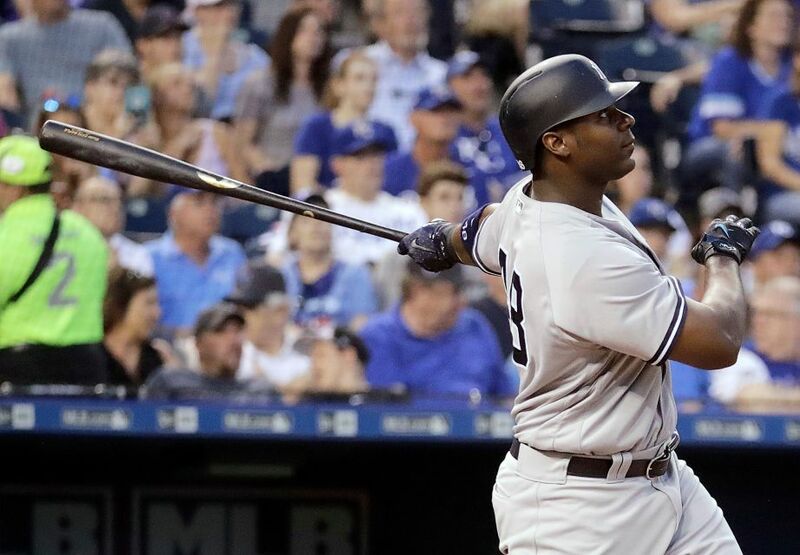 Matt Holliday grounded into a force out, but Gregorius came into score making it 7-0 Yankees. After Jonathan Holder loaded the bases, Merrifield grounded into a force out which allowed Jorge Bonifacio to score. Alcides Escobar would pop up to the short stop, and the Royals would ultimately fall to the Bombers 7-1 in game one. Tomorrow night 8:15 PM ET, the Yankees look to solidify the series against the Royals as Michael Pineda (3-2, 3.27 ERA) takes the hill looking to put together another quality start on the season. For the Royals, left hander Jason Vargas (5-1, 1.01 ERA) will look to even up the series, and continue his dominant start to the season. Over his last three outings, Vargas has given up only one earned run, so this will be a great test for the Bombers and their A.L. leading 57 home runs.